Happy Monday, everyone!! I hope you all had a wonderful weekend. Life is only just now getting back to normal after nearly the entire town was snowed in! But it’s back to business as usual this Monday, and I’m actually excited about it, because today I get to share another interview with you! When Eve is rescued from a horrific coach crash by her teachers, she is shocked to discover they possess super strength and speed. But what happens next is even more harrowing. In the aftermath of the crash she discovers that everyone in her life from neighbours, doctors, dentists, teachers, shop keepers and even her family and friends are actually super strength Guardians sent to protect her. They all have one thing in common, a single minded ferocity that she must be kept alive at all costs. But those that seek to destroy her move ever closer. Will the Guardians be enough to protect her when so many are prepared to stop at nothing to see her dead? And will she be strong enough to fulfil her destiny when the time comes? A fast paced fantasy adventure for young adults. With high speed car chases, airborne fights, amazing stunts and super powered beings, this is a story of loyalty, friendship and love. So sit back and grab a cup of tea with us, so to speak, while we chat with Holly about several of the different projects she’s juggling at the moment, how she keeps it all together, and what her biggest piece of advice for fellow writers is! 1. What drew you to writing, initially? I’ve always loved writing stories, even as a child. I like that element of control, of being able to create the worlds and characters that I want to see. When I write, the characters do exactly as I tell them to do, most of the time. I love that escapism into another world, of creating characters and scenes so real that you can almost reach out and touch them. Since The Sentinel has been released, there is no greater feeling than when someone writes to you to say how much they are enjoying it, or that they couldn’t put it down or that it made them laugh or cry. To know my writing, that something that I have created, has touched someone to that extent is an incredible feeling. 2. What is your favorite part about writing young adult fiction? How does it differ from other genres? I love the fantasy element of young adult fiction, where anything and everything is possible. Shape Shifters, super strength beings and amazing super powers fill the pages of The Sentinel and I love that the only limit is the extent of my imagination. Other genres are more true to life and that’s not a bad thing, but I enjoy creating new ideas, making the impossible, possible. 3. The Sentinel is just the beginning – there will be several books to follow in the series, so what do Eve and the Guardians have to look forward to in the next installment? There’s lots more exciting adventures for Eve in the next book. She becomes a lot stronger in her powers and we see her achieving some incredible things. But her growing strength attracts the attention of The Oraculum, the council of nine that created her and when they meet they don’t exactly see eye to eye. Eve also meets Seth’s half-brother, Zach and Adam who both play a very significant role in Eve’s future. Her Guardians continue to fight for her survival but some of them won’t survive themselves. 4. In addition to young adult fiction, you also write chick-lit for adults, is that correct? Is it a challenge to write for two such different audiences? What is the most difficult part? I don’t find it difficult at all to write different genres. Although The Sentinel is technically a young adult book, the majority of my readers so far are adults. They love the vivid descriptions so they can clearly picture it in their heads, the strong relationships, the almost tangible characters, the love story and those sort of things transfer over into my chick-lit books too. I suppose the hardest thing is thinking about what is age appropriate. What is suitable for a chick-lit adult book is different to what is suitable for a teen fiction book. There is a love story between Eve and Seth and I don’t want to go far into that knowing that young teens could be reading it. 5. Now that you are a published author, has anything changed for you during the writing process? What is the biggest difference you have experienced, between being a published author, and someone who is still hoping to get their work out there? I think when you first put your work out there, there is a desperate hope that someone, somewhere will like it. What if they hate it, what if no one buys it? Then slowly the feedback starts to trickle back to you. And it’s good. People like it, they tell others and they read it and like it too. Now suddenly there is a huge responsibility to make sure book two is just as good. Before I was just writing for me, writing the kind of stories I wanted to see, but now I have to please the people who have fallen in love with The Sentinel too. A lot of my reviews or messages from my readers have said how excited they are for book two and I don’t want to let them down. I want them to have that same passion, that same urgency to read book three when they finish book two, not get halfway through and sigh with disappointment. 6. What is the biggest piece of advice you could share with us today, that you wish someone had shared with you during the writing/publishing process? That rejection is not the end. I nearly gave up so many times. In my mind, and I know so many writers that have felt this, if I was getting rejected from agents and publishers then obviously I wasn’t good enough. But sometimes it’s not even your story that gets rejected, it could be your covering letter, your synopsis, that the agent/publisher doesn’t really have the time to read your story properly, or just the wrong person at the wrong time. Just keep trying, if it’s your dream to be published, never give up. And one more thing. I know they say never judge a book by its cover but the cover is so important and probably the single biggest factor when people decide to buy your book or not. They have to be attracted to the cover for them to click on it or pick it up and read your blurb. A poor cover could mean people might pass it by without reading a single review or even the first line. The cover really could be the make or break of a book. I love the cover of my book The Sentinel, designed by Scarlett Rugers, it just captures the very essence of the story. 7. I understand that recently your novel The Guestbook won a writing contest from Carina – how did it feel to have your writing publicly acknowledged in such a positive way? That was an incredible feeling. I don’t think I’ve stopped smiling since. It has taken me four years of trying, of rejections, of knock backs and suddenly with one email and shortly after one over excited phone call and everything had changed. I had to go to a glitzy awards evening to receive my award and my editor (I don’t think I’ll ever get used to saying that) stood up in a room full of a hundred people and told them all how much she loved my book. She said to me afterwards, ‘Do you actually realize how special The Guestbook is?’ It still hasn’t sunk in yet. 8. You’re also expected to pen two more novels for Carina as well – will they be follow-ups to The Guestbook, or stand-alone works? I love The Guestbook so much that I’m tempted to write a sequel, but I think the uniqueness of the story will only work as a stand-alone piece. I think my second book for Carina will be One Hundred Proposals. I entered a short story competition earlier this year and my story won and was published in Sunlounger, an anthology of short summery stories alongside some of my favorite authors. I received so many messages about how much people enjoyed my short story that I decided to make it into a full length novel. One Hundred Proposals is that novel. 9. Where do you find the inspiration for all of your different books and characters? Does it all come from the same place, or do you find inspiration for each of the novels in different and unique situations? Sometimes I just get an idea for a conversation or a short scene and I write it down, sometimes nothing happens with that scene, sometimes I might write another scene with the same characters and then suddenly another scene might appear because of it and soon I have a whole book planned out in my head. Most of my books have developed from one short scene that I have written. Real life inspires me, a lot of the humor in my chick-lit books have come from situations that have happened to me or my friends. Some are embellished or exaggerated for the purpose of the book, some are written exactly as it happens. People watching is a great source of inspiration. Someone walks past you in the shops or someone you meet for just a few minutes, or a conversation between two strangers and that night they might get immortalized in the pages of one of my books. Some of my friends are in The Guestbook, hopefully they won’t be too annoyed when they see themselves as book characters. 10. I know that you have a lot coming up with the sequel to The Sentinel, as well as several of the other projects that we talked about here today – is there anything else readers can look forward to seeing from you in the future? I have a short story in Merry Chick Lit which has just recently been released with all profits going to breast cancer care charity Rocking the Road to a Cure. I will also be writing another short story for Sunlounger 2 next year. Thanks for the brilliant interview Andrea, it was a pleasure to take part. 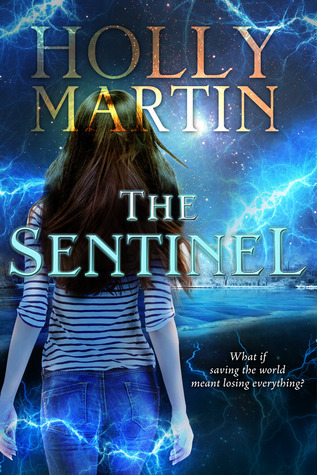 Click Here to purchase your copy of The Sentinel by Holly Martin, today!